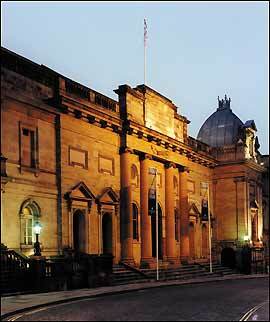 On Saturday, 11th April 2009, juejue and myself obtained tickets to attend an all nighter at The Galleries Of Justice. Although nothing really extraordinary happened, we did have an experience and captured things on film. I am going to place topics in this section and material to bring you an insight of a night to remember. This is the same voice. Turn your volume to the full and repeat it over and over. I cannot tell what the voice is saying? If you are using 'Windows Movie Maker' (this is better) , wait until it loads up, then click the first frame on the 'Story Line' which should start the video. This Voice Appears to be saying:- "Okay"
George, what can you tell us about this building? I did hear something but couldn't make out what it was saying. The Galleries of Justices is an old court house establisment that has become a musium. It dates back to around the 1700s and had public executions on the steps outside. It has a reputation to be haunted as there has been many great sufferings especially in the condemend cells below. People were often put to death for the most menial of crimes. The first time I visited the Galleries of Justices was when I was asked to repair their computers. (I am a computer engineer). At the reception, I once caught a mist gliding in front of one of the CCTVs. When I pointed this out to the reception girl, she said they were used to this. Much can be obtained from the Internet. On the day I visited the place for this ghost hunt, the flask of tea that I took with me, shattered in the back seat of my car.